Proteomics is the study of the entire set of proteins produced by a cell type in order to understand its structure and function. Proteomics investigates how proteins affect and are affected by cell processes or the external environment. Within an individual organism, the genome is constant, but the proteome varies and is dynamic. Every cell in an individual organism has the same set of genes, but the set of proteins produced in different tissues differ from one another and are dependent on gene expression. Proteomics is a relatively-recent field; the term was coined in 1994 while the science itself had its origins in electrophoresis techniques of the 1970’s and 1980’s. The study of proteins, however, has been a scientific focus for a much longer time. Studying proteins generates insight into how they affect cell processes. Conversely, this study also investigates how proteins themselves are affected by cell processes or the external environment. Proteins provide intricate control of cellular machinery; they are, in many cases, components of that same machinery. They serve a variety of functions within the cell; there are thousands of distinct proteins and peptides in almost every organism. The goal of proteomics is to analyze the varying proteomes of an organism at different times in order to highlight differences between them. Put more simply, proteomics analyzes the structure and function of biological systems. For example, the protein content of a cancerous cell is often different from that of a healthy cell. Certain proteins in the cancerous cell may not be present in the healthy cell, making these unique proteins good targets for anti-cancer drugs. The realization of this goal is difficult; both purification and identification of proteins in any organism can be hindered by a multitude of biological and environmental factors. The study of the function of proteomes is called proteomics. A proteome is the entire set of proteins produced by a cell type. Genomics led to proteomics (via transcriptomics) as a logical step. Proteomes can be studied using the knowledge of genomes because genes code for mRNAs and the mRNAs encode proteins. Although mRNA analysis is a step in the right direction, not all mRNAs are translated into proteins. Proteomics complements genomics and is useful when scientists want to test their hypotheses that were based on genes. Even though all cells of a multicellular organism have the same set of genes, the set of proteins produced in different tissues is different and dependent on gene expression. Thus, the genome is constant, but the proteome varies and is dynamic within an organism. In addition, RNAs can be alternately spliced (cut and pasted to create novel combinations and novel proteins) and many proteins are modified after translation by processes such as proteolytic cleavage, phosphorylation, glycosylation, and ubiquitination. There are also protein-protein interactions, which complicate the study of proteomes. Although the genome provides a blueprint, the final architecture depends on several factors that can change the progression of events that generate the proteome. Large-scale proteomics machinery: This machine is preparing to do a proteomic pattern analysis to identify specific cancers so that an accurate cancer prognosis can be made. 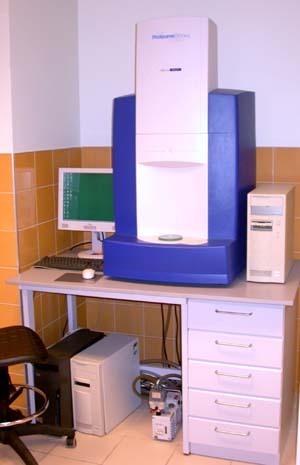 The basic techniques used to analyze proteins are mass spectrometry, x-ray crystallography, NMR, and protein microarrays. Mass Spectrometry is a technique that is useful for determining the size of a protein or protein complex. X-ray crystallography and NMR are techniques useful for determining the 3-D structure of a protein or protein complex. Protein microarrays are useful for determining protein-protein interactions. The ultimate goal of proteomics is to identify or compare the proteins expressed in a given genome under specific conditions, study the interactions between the proteins, and use the information to predict cell behavior or develop drug targets. Just as the genome is analyzed using the basic technique of DNA sequencing, proteomics requires techniques for protein analysis. The basic technique for protein analysis, analogous to DNA sequencing, is mass spectrometry. Mass Spectrometer: Matrix-Assisted Laser Desorbtion Ionisation – Time Of Flight (MALDI-TOF) Mass Spectrometer. Mass spectrometry can be used in protein analysis. Mass spectrometry is used to identify and determine the characteristics of a molecule. It is a technique in which gas phase molecules are ionized and their mass-to-charge ratio is measured by observing acceleration differences of ions when an electric field is applied. Lighter ions will accelerate faster and be detected first. If the mass is measured with precision, then the composition of the molecule can be identified. In the case of proteins, the sequence can be identified. The challenge of techniques used for proteomic analyses is the difficulty in detecting small quantities of proteins, but advances in spectrometry have allowed researchers to analyze very small samples of protein. Variations in protein expression in diseased states, however, can be difficult to discern. Proteins are naturally-unstable molecules, which makes proteomic analysis much more difficult than genomic analysis. X-ray crystallography enables scientists to determine the three-dimensional structure of a protein crystal at atomic resolution. Crystallographers aim high-powered X-rays at a tiny crystal containing trillions of identical molecules. The crystal scatters the X-rays onto an electronic detector that is the same type used to capture images in a digital camera. After each blast of X-rays, lasting from a few seconds to several hours, the researchers precisely rotate the crystal by entering its desired orientation into the computer that controls the X-ray apparatus. This enables the scientists to capture in three dimensions how the crystal scatters, or diffracts, X-rays. The intensity of each diffracted ray is fed into a computer, which uses a mathematical equation to calculate the position of every atom in the crystallized molecule. The result is a three-dimensional digital image of the molecule. X-ray crystallography: X-rays that hit atomic nuclei are diffracted onto a detector. Another protein imaging technique, nuclear magnetic resonance (NMR), uses the magnetic properties of atoms to determine the three-dimensional structure of proteins. NMR spectroscopy is unique in being able to reveal the atomic structure of macromolecules in solution, provided that highly-concentrated solution can be obtained. This technique depends on the fact that certain atomic nuclei are intrinsically magnetic. The chemical shift of nuclei depends on their local environment. The spins of neighboring nuclei interact with each other in ways that provide definitive structural information that can be used to determine complete three-dimensional structures of proteins. 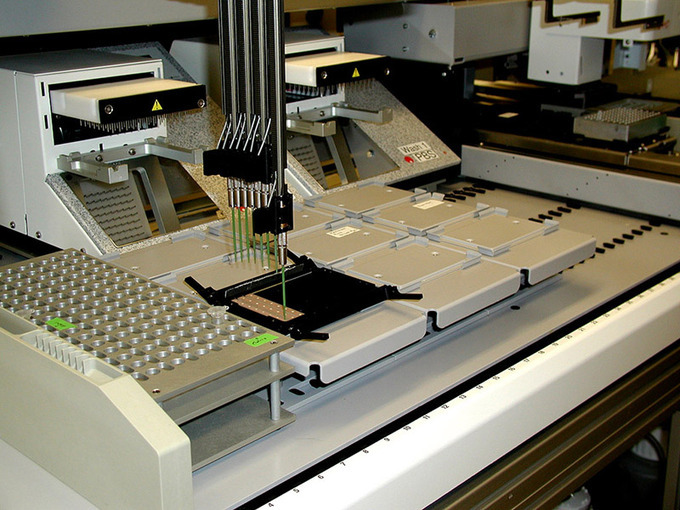 Protein microarrays have also been used to study interactions between proteins. These are large-scale adaptations of the basic two-hybrid screen. The premise behind the two-hybrid screen is that most eukaryotic transcription factors have modular activating and binding domains that can still activate transcription even when split into two separate fragments, as long as the fragments are brought within close proximity to each other. Generally, the transcription factor is split into a DNA-binding domain (BD) and an activation domain (AD). One protein of interest is genetically fused to the BD and another protein is fused to the AD. If the two proteins of interest bind each other, then the BD and AD will also come together and activate a reporter gene that signals interaction of the two hybrid proteins. Two-hybrid screening: Two-hybrid screening is used to determine whether two proteins interact. In this method, a transcription factor is split into a DNA-binding domain (BD) and an activation domain (AD). The binding domain is able to bind the promoter in the absence of the activator domain, but it does not turn on transcription. A protein called the bait is attached to the BD, and a protein called the prey is attached to the AD. 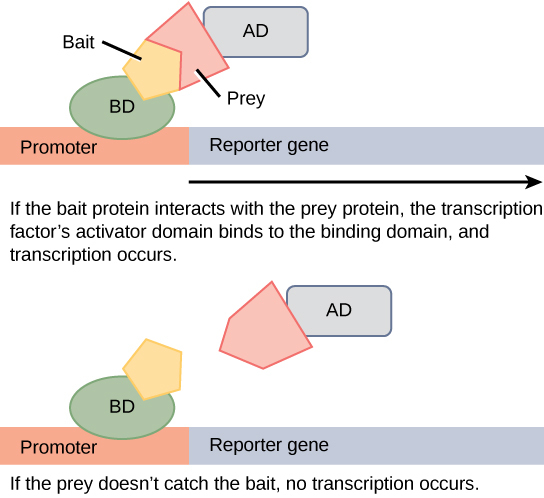 Transcription occurs only if the prey “catches” the bait. The western blot, or protein immunoblot, is a technique that combines protein electrophoresis and antibodies to detect proteins in a sample. A western blot is fairly quick and simple compared to the above techniques and, thus, can serve as an assay to validate results from other experiments. The protein sample is first separated by gel electrophoresis, then transferred to a nitrocellulose or other type of membrane, and finally stained with a primary antibody that specifically binds the protein of interest. A fluorescent or radioactive-labeled secondary antibody binds to the primary antibody and provides a means of detection via either photography or x-ray film, respectively. Proteomics, the analysis of proteins, plays a prominent role in the study and treatment of cancer. Identifying those proteins whose expression is affected by disease processes can be used to improve screening and early detection of cancer. Different biomarkers and protein signatures are being used to analyze each type of cancer. A future goal of cancer proteomics is to have a personalized treatment plan for each individual. Genomes and proteomes of patients suffering from specific diseases are being studied to understand the genetic basis of diseases. The most prominent set of diseases being studied with proteomic approaches is cancer. Proteomic approaches are being used to improve screening and early detection of cancer, which is achieved by identifying proteins whose expression is affected by the disease process. An individual protein that indicates disease is called a biomarker, whereas a set of proteins with altered expression levels is called a protein signature. For a biomarker or protein signature to be useful as a candidate for early screening and detection of a cancer, it must be secreted in body fluids (e.g. sweat, blood, or urine) such that large-scale screenings can be performed in a non-invasive fashion. The current problem with using biomarkers for the early detection of cancer is the high rate of false-negative results. A false-negative is an incorrect test result that should have been positive. In other words, many cases of cancer go undetected, which makes biomarkers unreliable. Some examples of protein biomarkers used in cancer detection are CA-125 for ovarian cancer and PSA for prostate cancer. Protein signatures may be more reliable than biomarkers to detect cancer cells. 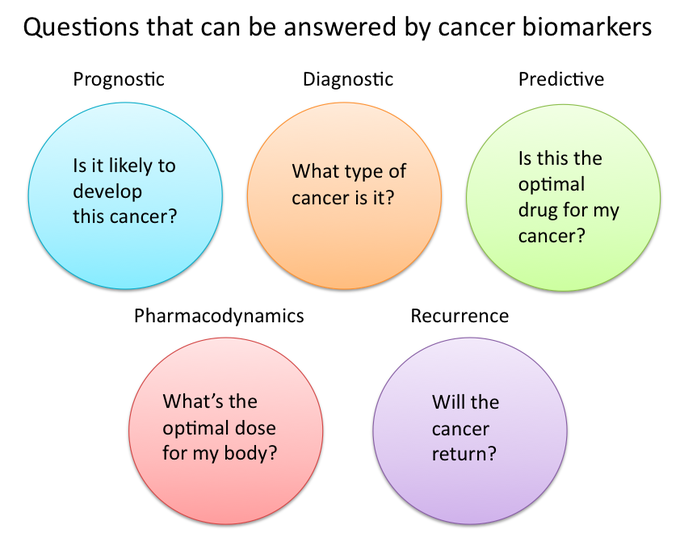 Questions that can be answered by biomarkers: In cancer research and medicine, biomarkers are used in three primary ways: (A) Diagnostic – To help diagnose conditions, as in the case of identifying early stage cancers. (B) Prognostic – To forecast how aggressive a condition is, as in the case of determining a patient’s ability to fare in the absence of treatment. (C) Predictive – To predict how well a patient will respond to treatment. Proteomics is also being used to develop individualized treatment plans, which involves the prediction of whether or not an individual will respond to specific drugs and the side effects that the individual may experience. In addition, proteomics can be used to predict the possibility of disease recurrence. The National Cancer Institute has developed programs to improve the detection and treatment of cancer. The Clinical Proteomic Technologies for Cancer and the Early Detection Research Network are efforts to identify protein signatures specific to different types of cancers. The Biomedical Proteomics Program is designed to identify protein signatures and design effective therapies for cancer patients.